Note in the chart below of the NASDAQ Composite Index that both our Trendlines (upward sloping red & blue) and the Support level at 3040 have been broken. This market has been in a correction, tho down a modest 6% from the Sept. 21 highs. The next question is how far will it go and how will we know that its likely completed. I offer a few ideas. 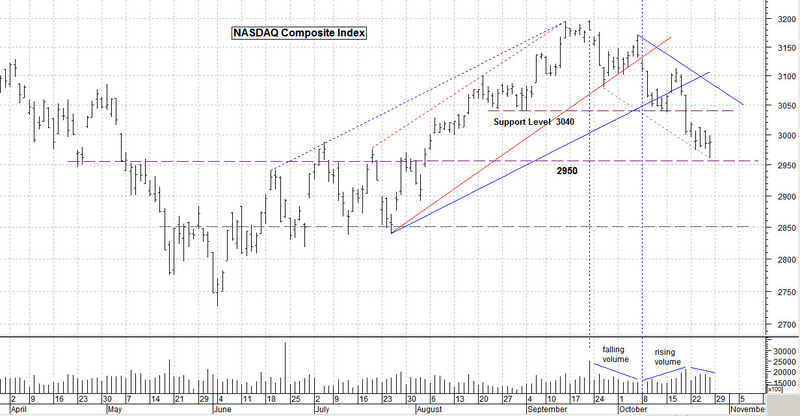 First, the market is at a support level in the 2950 area currently. Also note that the downward trend in the near term is slowing and perhaps attempting to put in a base (or floor if you will) near this level. Volume is slowing, hence activity and supply is slowing. I believe that the market is waiting for more “news”, either from the earnings side (which has some disappointed) or from Europe or some other geo-political source. This pause is important, in that this level may hold and build a “structure” to mount a move higher or it will be broken and more selling will kick in. I see the next level below the current 2950 area to be about 2850; about a 100 NASDAQ points lower. That would retrace most of the move since mid-June of this year. In spite of what many may think, I don’t think the US elections have a whole lot to do with this action. We’ll see. So we will observe further signs of weakness or new signs of strength. That process could take weeks to fulfill as a basing structure builds with a few ups and downs within it. Right now I see weakness but not wholesale selling. More like a lack of buyers than anything else and a rotation out of stocks that have appreciated too much and back into Cash for the short-term. The pie chart below gives me that impression. 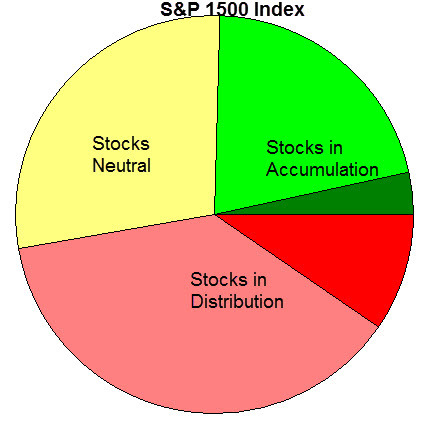 The Accumulation (buying) vs. Distribution (selling) pie chart of the component stocks of the broad S&P 1500 shows more selling than buying (for sure), but there is a big component of Neutral stocks as well. We’re right near the cusp of over 50% “red” Distribution which would concern me over a longer period, indicating more downside risk. For now, we’re holding onto the moderate down turn scenario. I have exited most positions and have a light short bias via “short” ETF’s (ones that increase in price as the indexes go down). Even though my market model and trend lines are bearish it could be rather late to buy any more “Bear Funds” untill a further decline is validated. What’s doing well right now? Internationally, a few weak Euro zone countries are improving. Greece, Italy and also Turkey; China as well. These are just “OK” but not very strong, so I’d be very careful with them; they are volatile. The chart above shows US Industrial sector strength in the near term. These areas are still holding onto their recent gains. Technology and Finance have taken a beating as of late, and may take some time to recover in any market. Takes about it for this week. Watch these levels for clues of the future movements as money managers are on the fence as to what to do next. Right now, Cash is looking just fine to me. Have a good week. ….. Tom …..
click on any graphic to enlarge it; charts courtesy of MetaStock and www.highgrowthstock.com all used with permission. Comments and feedback are welcome.